Don't let the hunting end when grouse season comes to a close. In some of the northern states you can work your spaniel for at least one to three months longer on rabbits. You'll not find cottontail in open land, but rather in some of the thickest and most challenging of cover. Just as when hunting grouse and woodcock, a close-working dog is a must for rabbits. The drills for working rabbits will help the dog learn to work close. Start your young pup by taking walks together in light to medium cover. Gradually, every few weeks, work him into heavier and more varied cover. If the young dog seems hesitant to enter the cover, toss his favorite buck or a ball into the thicket to excite and entice him in. After a few drills, your pup should go into cover without even giving it a second thought. One of my favorite places to work a young dog is in an old, over-grown fencerow. Doing so is a fun way to get the pup to start using its nose. Enlist a helper. Position yourself and the pup on the down wind side of the hedgerow, with the assistant on the opposite side where they will plant a clipped wing bird. A bit of electrical tape wrapped securely around the flight feathers works well. Send the pup through the fencerow for the find using a command such as "in" or "get in". This will be useful down the road when hunting under heavy brush or briars. Once he has found the bird, encourage him to retrieve back through the thicket. As the young dog progresses to flyers, and he has become steady to shot, plant your birds on the up wind side of the hedgerow, stationing your gunner there, as well. Next, move to an area where the rabbits are. 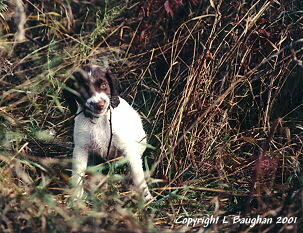 At this point, the young dog should be steady to flush and shot - plus is able to retrieve well to hand. If he flushes a rabbit or two and all goes well, have a training bird to toss into the cover, close to you, that can serve as a retrieve - and a reward for a job well done. This will also reinforce the idea that game will be found near the hunter. When working your dog in fencerows, briar patches, or brush piles, limit the use of your whistle - or better yet, just leave it at home. Instead, a "click" of the mouth can get the dog's attention and using hand signals enables you to direct him. We will often slip a small bell onto our dogs' collars while hunting rabbit. This is particularly useful in thick cover where watching it work can be difficult to impossible. The bell doesn't spook the rabbit. Interestingly, when a dog wearing a bell is steady to the flush, a rabbit will usually run out a short distance, then stop and look back, affording the hunter a shot.